Incredible things happen when an organization has amazing supporters. Due to a major storm packing dangerous winds and flooding rains, the Steps for Life 5k moved indoors from Battery Park to Brookfield Place. Yet spirits were high as more than 200 people came to support the fundraising event in spite of the weather. 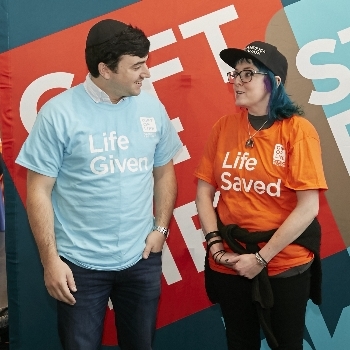 Two people were especially excited – a lifesaving stem cell donor, Harvey Pava and his recipient, Florence Ivy – who were introduced to each other for the first time. Nearly two years after donating peripheral blood stem cells to save a stranger’s life, Harvey was ready to meet the woman whose life he had saved. The 27-year-old mortgage broker from East Brunswick, N.J., was welcomed to podium by Robin Fineman. Harvey swabbed his cheek during the search to find her son, Ezra, a matching donor. Ezra joined his mother and father, Evan, and had the opportunity to meet Harvey. Harvey was crossing the lobby of his dorm at Yeshiva University in 2011 when he saw a friend hosting a donor drive for Gift of Life. He stopped by to say hello and decided to swab his cheek. Although he was called as a potential match within the first year, the transplant did not go forward. It’s rare to be called even once, yet Harvey was called as a match a second time in 2015 to donate stem cells to a woman whose health was failing due to an inherited immune disorder. Florence, 42, is a writer and photographer from Mastic Beach, N.Y. “We’re like twins, now,” she said to Harvey, referring to the immune system and blood type they now have in common. She had suffered from pulmonary infections her entire life due to a rare chromosome flaw called RAC2 that prevented her immune system from fighting infections. After enduring 18 major surgeries during her lifetime, Florence decided to participate in an experimental program at the University of Pittsburgh Medical Center, and was considering a lung transplant. Her doctors suggested a marrow transplant alone could improve her condition, and that proved to be a breakthrough for her. The Big Apple has so many superheroes! 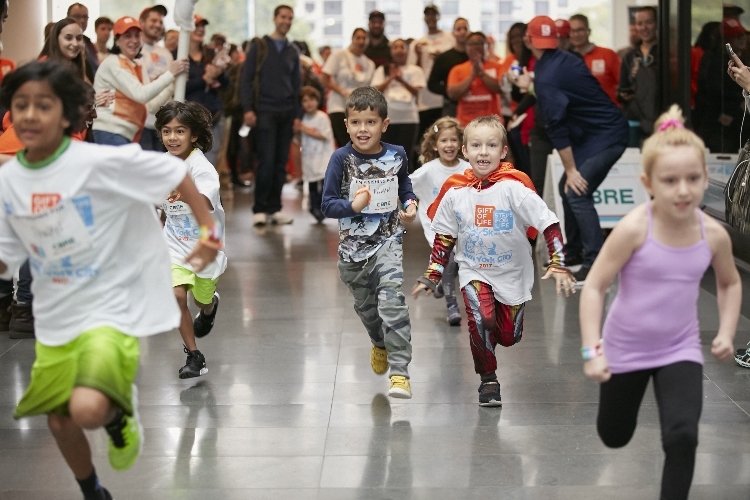 Our supporters ages 6 and under lined up to test their sprinting skills and with their orange Gift of Life capes flying, they completed the 50-yard dash and were awarded medals. 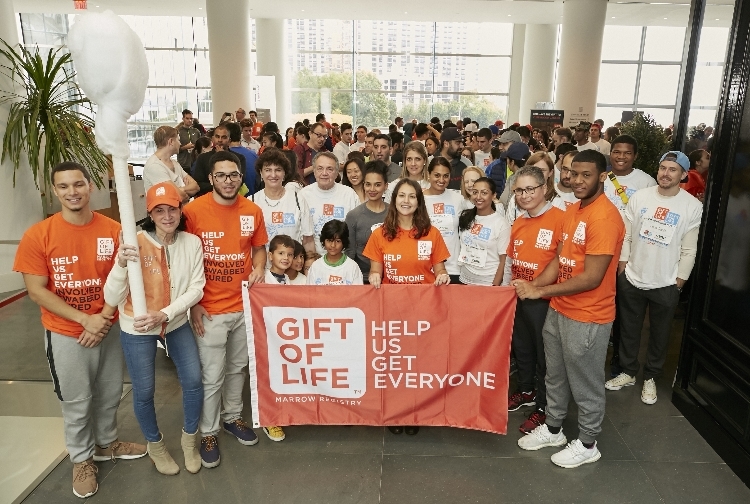 After Harvey and Florence were introduced, 5k Grand Marshal Wendy Siegel and Gift of Life founder and CEO Jay Feinberg led the crowd to the starting line of a walking course marked out around the expansive main floor and atrium of Brookfield Place. Although a few people ran their laps at a trot, most walked and pushed strollers, happy to be out of the rain and knowing that their fundraising efforts would make more lifesaving transplants, and introductions like Harvey and Florence’s, possible in the future. “The teams and individuals raised more than $65,000,” said Gift of Life National Events Coordinator Linda Barrocas. 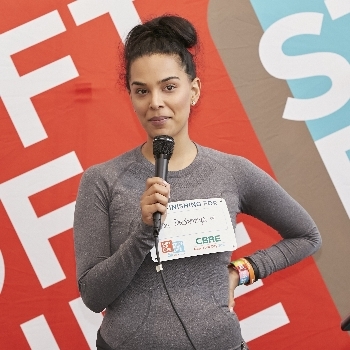 “We are thrilled that so many people showed their support for Gift of Life’s mission to cure blood cancers.” Funds raised at the event will add new donors to the registry, where they may be found as a lifesaving match for a patient in desperate need. Our sponsors make the Steps for Life 5K Run & Walk possible. Thank you! View NY1 Spectrum News coverage of the event. View the event photo gallery. Steps for Life 5k of South Florida 2018 will be held on January 14 at the South County Regional Park in Boca Raton, Florida. Register now and start your team! 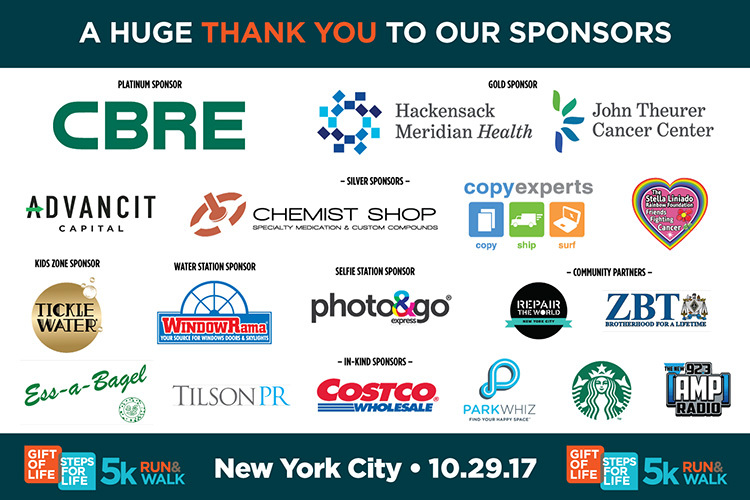 A special thank you to Gift of Life board member and Chairman of Global Brokerage at CBRE, Inc., Stephen Siegel, who helped relocate the event from Battery Park to Brookfield Place. CBRE Inc. is the Platinum Sponsor for Gift of Life’s Steps for Life 5k events.